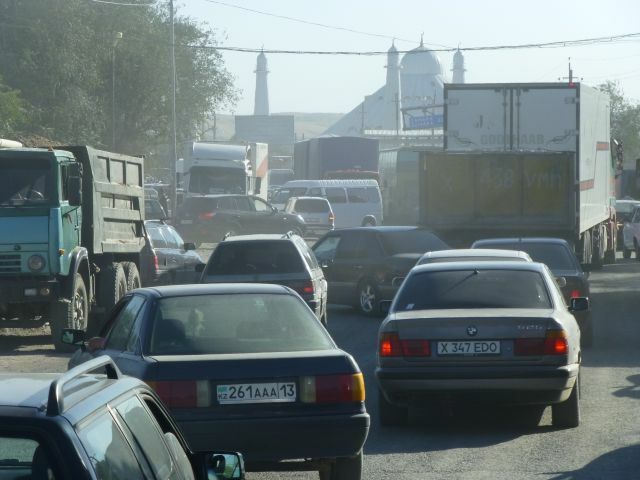 We crossed the border with Kyrgyzstan and it was then only a half hour drive to Taraz where we stayed in a hotel. Staying in a hotel makes it easier to get the immigration card processed. The processing involves getting the card stamped by the Migration Police within 5 days of arriving in the country. 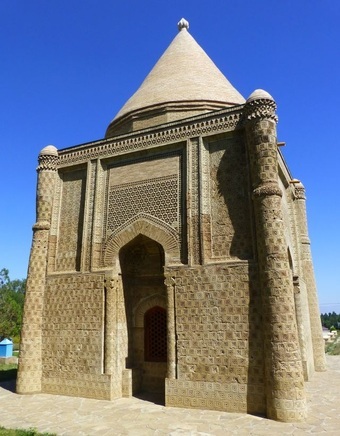 The heavily restored, intricately carved terracotta Aisha Bibi Mausoleum. 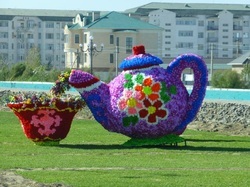 Not much to see in Taraz although it is Constitution Day today and a public holiday with various activities. Fortunately one Migration Policeman was working and we were able to get our Immigration cards stamped and validated until the end of our visas. So we headed out of town to the mausoleum of Aisha Bibi. The mausoleum is interesting because the external terracotta surfaces are all carved. From here the 2500 km drive to Russia begins. 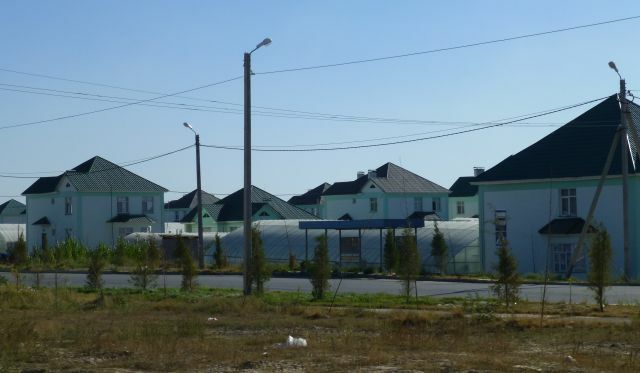 We got to the industrial city of Shymkent in the late afternoon and saw an interesting housing development with long greenhouses between the homes. Then as we went to leave the ring road to exit town we found ourselves in a massive traffic jam due to an accident and roadworks. We, along with many others did not know that the exit had been closed due roadworks and so we did a lap of the markets to get across the exit road. Crazy, and in the middle of the horn blowing the call to prayer rang out. Dusty potholed roads followed. Literally green housing with greenhouses between the green houses. Traffic jam with Darth Vader looking mosque in the background. 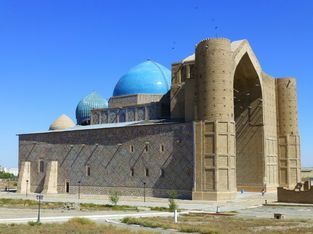 Started with driving to Turkistan to see the Mausoleum of Khodja Ahmed Yassaui. The dome on the mosque is supposedly the most beautiful looking one in all of Kazakhstan so the guide books say. The centuries old mosque did look very attractive. The sides and top of the mosque were finished. Sauren, an old silk route town. 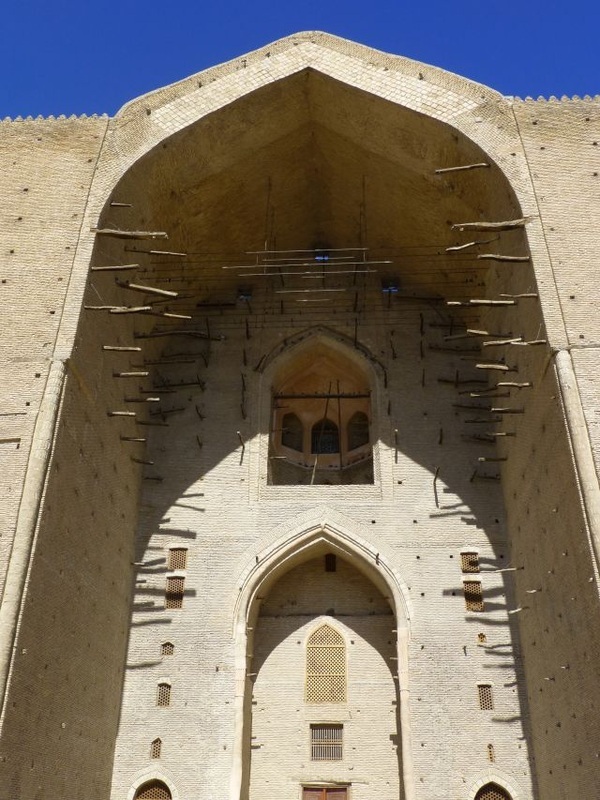 The front facade of the mosque was never finished. The scaffolding remaining in place for more than 500 years. 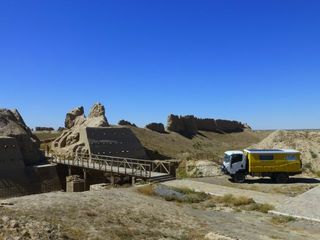 North of Turkistan we visited Sauren, once a thriving town during the silk route times. Mostly ruins now but some restoration being done. Then on to Kyzylorda, thriving with the minerals boom. Only pulled up by police three times today. Even though we only have light tinting on our windows, it is illegal on the front windows here. That incurred a small fine - getting better at reducing them now, then next stop they wanted to see our truck papers and then the papers to say that Guy had a truck licence. The International Drivers Licence is rather vague and says that we can drive a vehicle above 3500kgs and tow a trailer. He wanted to know why we didn't have a trailer. Gave up in the end! We covered 1,940 kms over the next four days with one point of interest being driving past the Baykonur Cosmodrome from where Yuri Gargarin was launched to become the first person in space. But the cosmodrome is still used today for space tourism and other Russian space launches. Very difficult to get to see around the Russian leased land though. The other place of interest was Aral which used to be a major fishing port on the Aral Sea, the fourth largest inland lake in the world in 1960. Unfortunately it was knowingly destroyed by the Soviets when they diverted its waters for irrigation further south. Aral is now 76 kms from the shoreline of the northern part of the sea which is now divided from the south. Marooned ships remind us of the past. We crossed into Russia and drove onto Saratov even further west.